with Dr. Kathleen Rosenblatt & Attorney Danny Sheehan, Esq. 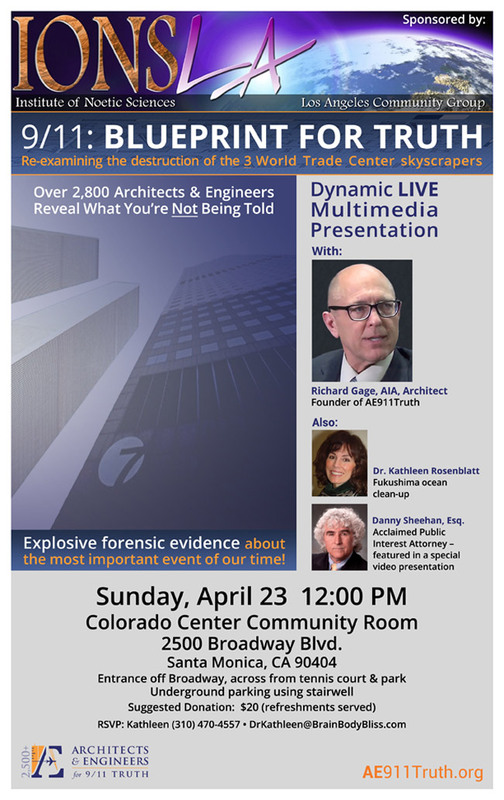 Join Richard Gage, AIA, on Sunday, April 23rd, as he presents his latest multimedia presentation 9/11: Blueprint for Truth — Re-examining the destruction of the 3 World Trade Center Skyscrapers in Santa Monica. He'll be joined by Dr. Kathleen Rosenblatt, discussing the Fukushima ocean cleanup. There will also be a special video presentation featuring Danny Sheehan, Esq., acclaimed Public Interest Attorney. Entrance is off Broadway, across from the tennis court & park. Underground parking using stairwell.